Imphal,: The Gorkha community has always been defined by the quality of bravery, courage, honesty and dignity. The community through their undying spirit of bravery, loyalty and sacrificing will for the welfare of the people has made a huge contribution in the Nation building and in the State as well, maintained Education, Labour & Employment Minister Thokchom Radheshyam Singh. 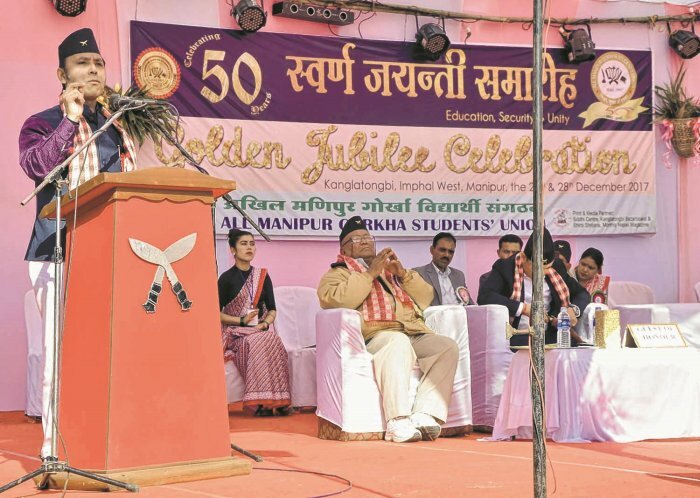 He was speaking at the inaugural function of a two-day Golden Jubilee Celebration of All Manipur Gorkha Students' Union (AMGSU) held at Hindi Higher Secondary School, Football Ground Kanglatongbi today. Radheshyam elaborated that due to such quality of courage and bravery, the Gorkha Regiments of the Indian Army was set up, playing a vital role in safeguarding and keeping the country safe till today. 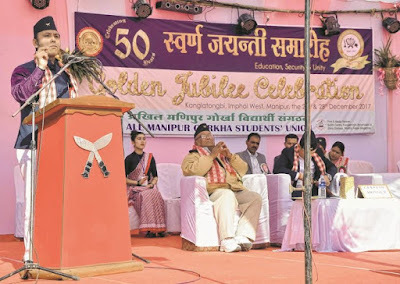 Congratulating AMGSU on its Golden Jubilee celebration, he said that 50 years is a very long time facing many hardships and problems which are yet to be overcomed. He called upon the students who are the future pillars to march for upliftment of the poor and weaker section of the society for an inclusive growth in line with the BJP Government's slogan "Sabka Saath Sabka Vikas" . The Government is ready to extend any assistance in this regard, he added. Saying that there is a huge population of labourers in the Gorkha community engage in different types of work, the Minister observed that there is a need to identify them and get registered for labour card so that they could benefit from the Government schemes. A memorial stone was unveiled during the celebration function. The union submitted a memorandum to the Minister on the occasion. MLA Sekmai AC Heikham Dingo Singh; Political Advisor to Chief Minister Dr RK Ranjan Singh; Deputy Commissioner, Imphal West Ningthoujam Geoffrey; members of AMGSU and locals attended the celebration function.